Last week, Slate published an article claiming that—counter to popular assumptions—the pesticide levels on most of the produce we eat are nothing to worry about. 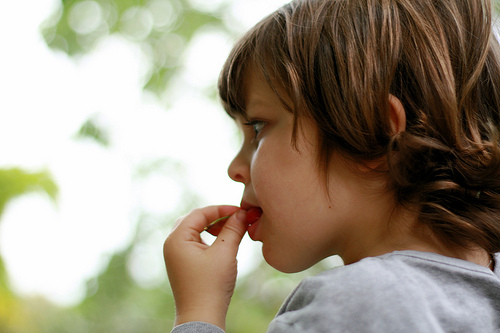 The title says it all: Organic Shmorganic: Conventional Fruits and Vegetables are Perfectly Healthy for Kids. In one sensational, simplistic article, author Melinda Wenner Moyer appears ready to undermine the 50-year battle that organic food advocates have waged against an increasingly monolithic industry to provide healthy, uncontaminated food. In the piece, Moyer concludes that conventionally grown produce that harbor pesticide residue are not harmful for kids and are not much worse than their organic counterparts. Moyer points to the fact that organic farms often use pesticides of their own. However, she also admits that most organic pesticides break down in the environment more easily and are less likely to contaminate the soil and water. That alone is a good enough reason to support organics since runoff from agriculture is the number one polluter of America’s waterways. Also, by Moyer’s own admission, pesticides are used in organic agriculture as a last resort, limiting our exposure even further. Moyer asserts that since synthetic pesticides are engineered to be used in smaller quantities, that might also somehow make conventional food less toxic overall than organic. But this sounds like the industry talking—why wouldn’t we seek to further regulate all toxic substances on our foods, whether organic or not, rather than concluding we might as well eat the conventional foods? When Moyer says that pesticides are “perfectly healthy for kids,” she doesn’t specify whose kids. It’s clear that she hasn’t considered farmworkers’ families and those who live near agricultural fields. These populations are routinely exposed to large quantities of pesticides and are greatly impacted. Moyer claims she is focusing primarily on the heath effects of consumers. But the logic of separating our own health from environmental health and worker health is specious. Just ask farmers. Kira Kinney, an organic farmer in New Paltz, New York, finds Moyer’s compartmentalized argument especially troubling. “The author says she is only looking at this narrow window of residue on produce, but I do not understand, as a grower, how one can break apart the farm process to only look at things in such narrow focus,” says Kinney. Kinney sees Methyl bromide—a fumigant that is being phased out in produce production, but is still in use on some farms—as a good example. “It is applied to the soils of most conventional strawberry farms—and other produce [farms] as well. It basically kills everything living in the soil, and makes lots of people sick in areas where this gas is being pumped into the soil,” she says. In fact, these are two completely different issues. Recent science on the microbiome, or bacteria in and on our bodies, shows that kids who grow up with dogs have a healthier microbiome and exposure to a variety of bacteria likely helps to improve our immune systems. But this has absolutely nothing to do with pesticides. Or perhaps it does. There is some evidence to suggest that one pesticide, glyphosate, the ingredient used in the ubiquitous Roundup may disrupt and kill beneficial bacteria in our guts leading to impaired immune function and a cascade of ill health effects. This shouldn’t come as a big surprise since pesticides, insecticides, and fungicides work to kill organisms indiscriminately. There are also numerous studies that show use of these various “cides” disrupts soil microflora, so why wouldn’t it disrupt our own as well? The basis of Moyer’s argument is that “the dose makes the poison” when it comes to the toxicity of pesticides. This concept is the cornerstone of toxicology and many toxicologists will tell you that’s all there is to it: Ill effects occur along a linear curve depending on how much of the toxin one is exposed to. However, much of the conventional thinking on this matter is being overturned. I asked Dr. Bruce Blumberg, a professor of developmental and cell biology and pharmaceutical sciences at the University of California, Irvine, about this theory. Blumberg works with endocrine disrupting chemicals and many pesticides fall into this category. Since toxicologists assume the linear dose response, the EPA rarely, if ever, tests for what exposure at lower levels may mean. But in Blumberg’s research, he routinely finds effects on the development of fat cells and the prevalence of obesity at levels near to or below what’s known as the “no observed adverse affect level” (or NOAELs) and sometimes at or below the EPA-established tolerable daily intake. In one study Blumberg found that the fungicide triflumizole caused changes to fat cells, and increased fat cell size at levels 400 times below the EPA approved NOAEL and four times lower than the tolerable daily intake. Furthermore, Moyer relies on the Environmental Protection Agency’s (EPA) data to back up her claim that pesticide residues are harmless. This is a huge oversight since the process by which pesticides receive EPA approval is riddled with conflicts of interest. Blumberg described the process like this: The EPA asks companies that are introducing new chemicals to perform basic tests, including tests for carcinogenesis and reproductive harm, for example. The company then performs these tests in-house or asks a contract laboratory to do them and shows the data to the EPA. “Despite this clear conflict of interest, the EPA says, ‘thank you very much,’ talks about the issue for a while, and then either approves, or disapproves the chemical for use based on the industry supplied data, which may or may not be complete,” says Blumberg. Zoeller added that Moyer’s article makes the mistake of claiming “safe levels” of pesticides. “I doubt seriously that EPA risk assessors would say it like that. They would say that according to the data they have, ‘levels of exposure below X should not produce adverse effects.’ There’s a big difference,” he says. it’s one factor we can control. What’s more, Moyer’s article makes no mention of the combined effects of these toxins. One 2011 study found that the widespread decline in male reproductive health may be linked to increased exposure to a combination of pesticides, which have not been adequately tested. Another 2012 study found that the combined effects of widely used pesticides exceed the effects of individual pesticides. To date, there is not nearly enough data on these combined effects, even though the average American is exposed to 10 or more pesticides every day, through food and drinking water. These dangers are especially worrisome for children and pregnant women. In fact, the American College of Obstetricians and Gynecologists recently warned about the dangers of exposure to pesticides and other toxins, as the average woman is exposed to an estimated 163 unique chemicals per day, according to the Environmental Working Group. The bottom line is that most data that suggests pesticide residue is safe is the result of a deeply conflicted regulatory system. Under our current system, we rely on the companies manufacturing these chemical to find them dangerous, rather than an independent entity to prove them safe. As such, these chemicals have never been deemed safe for children, expectant mothers, or anyone else at the doses most Americans are currently being exposed to. We now know that low levels of these toxins can adversely effect our microbiomes and our reproductive health, while increasing the risk of obesity. So why not err on the side of caution? Photo at the top of the page courtesy of Nora Kuby, photo on the right courtesy of Seattle Children’s Hospital. Correction: Moyer’s name was misspelled “Moyers” in two places in the original version of this story. Thanks for this article. After I read Moyer's Slate article, I was left with a lot of the same thoughts and questions you bring up here. However, one point of hers that I think you missed is the idea that a conventional apple is better than no apple. Moyer's talked about her fear of feeding her son a snack if it wasn't certified organic and she could verify that it was 'safe' for him to eat, to the extent that she would give him something packaged and processed instead. I agree completely that organic is better than conventional, but part of her point was that conventional is better than nothing, and I have to agree with that. This is my favorite rebuttal so far as you actually address the points made in the original. But from what you are saying here, it still doesn't matter if it has that "organic" label or not, there are toxins and pesticides in both, which was exactly Moyer's point; there is no benefit to a parent buying "organic" over the conventional to decrease that child's risk of exposure. Cleary you know that the current "certified organic" label is somewhat of a farce and there are many issues to address in large agriculture no matter what label it works under. Consumers of both organic and conventional fruits and veggies should know that sampling data shows that the majority of produce tested has no detectable residues at all. And, when residues are found they are at very very minute levels. Use the calculator function at safefruitsandveggies.com to learn how low those residue levels really are. The facts are that health experts, scientists and environmental groups, including the Environmental Working Group, all agree with the advice from the Slate Magazine article - eat more of either conventional or organic produce for better health and a longer life. And, there are literally decades of nutritional studies that support this recommendation and those were done largely using conventionally grown produce. One can expect more articles like "Safe Shmafe" because the public is becomming more concerned about pesticide and herbicide use. Food propaganda is nothing new, but the growing suspicion of pesticides, herbicides, and gmo's together with events like pollinator die-off assures me there will be a concerted and continuing PR campaign to quiet the worries. Hopefully, there will be more local and organic food available in the future. Thanks for such a thoughtful and well-supported article. I think the most compelling reason to favor organic is the health of our soil (and our gut biomes). People need to understand how many tiny living things are in a handful of soil (and in our own intestines). I'm a huge fan of biodynamic farming for this reason. Well-written! I didn't even think of this many oversights in the Organic Schmorganic piece - truly simplistic without much evidence (if at all). It seems like, in the end, we SHOULD be moving toward an overall testing and classification of toxins (pesticides and otherwise), and encouraging the public to know more and have more information available to all. This can't occur if articles like this whitewash what's really out there - terrible moves for the environment included in your child's diet. And yeah, fresh fruit of any sort is better than none at all (or worse, highly refined and processed foods), but at what levels is she feeding her child those things? Is it interspersed with a mostly organic diet or in conjunction with a highly-processed diet? The multifactorial nature of nutrition and health (for humans and for the planet) is really glossed over in her article and really addressed here. While we agree that everyone should eat more fruits and vegetables, we do not agree that residue and risk levels of organic and conventional are the same or that residue levels on conventional produce are insignificant. In 2012, the venerable American Academy of Pediatrics – hardly a hotbed of “environmental activists” - took the unprecedented step of issuing an exhaustive study about the unique risks conventional pesticides pose to children’s health. The Academy reviewed all of the regular routes of exposure, including food, warning parents and policymakers to take steps to reduce the use of toxic agriculture pesticides. In its advice to pediatricians, the AAP’s report recommends they urge parents to turn “toward reliable resources that provide information on the relative pesticide content of various fruits and vegetables” citing EWG’s Shopper’s Guide to Pesticides in Produce as one of the two sources for parents to use. The American Academy of Pediatrics, among other experts is concerned about children’s health and pesticides because children often consume much larger quantities of fruits, vegetables and juice than adults relative to their body weight. A child’s immune and detoxifying systems, not to mention their neurological development, are far from fully formed, unlike adults. I’ll go with the advice from the nation’s pediatricians about dietary exposures to pesticides and children’s health over that of a conventional agribusiness front group whose main goal is to get Americans to eat pesticides, along with their food. I am curious if this post was edited because the original article or response that Kristen wrote shows Moyer's twice as claimed above by Melinda's response. But she is not referring to Melinda as a Moyers she is using the name in the plural. If a writer is unable to see that simple difference I question most of what they have to say. On the other hand if it was edited so be it. And as for the topic at hand Kristen thanks for your rebuttle. Thank you for you article! It was really well written! I think most intelligent people that read Moyers article already knew it was a load of crap! I guess it's a personal choice in the end if she wants to poison her child/children with pesticides since currently it's legal to do so. What's unfair is encouraging others to do so. I guess in the end she will have to live with her words and personal decisions and in the end nothing she says now or on the future will mean anything at all now that she has written garbage. Again thank you for writing an article that puts children and our environment first. You obviously have class! Thanks from a mom! Thanks for publishing this sound critique of the slate piece. I had similar issues with the original author's piece. Notably, she sets up a straw-man argument by saying that organic pesticides are potentially just as dangerous as conventional pesticides, therefore organic isn't any safer. The flaw in the logic is that just because the USDA allows them, doesn't mean organic growers use them. Talk to local farmers, ask the growers at your farmer's market what they use. Most local farmers use crop rotation and other organic methods to thwart bugs and fungus without resorting to any treatments. Yet the author's whole argument rests on the faulty presumption that all organic farmed produce contains some form of pesticides, which is just blatantly not true. I have tried to find this answer on line but have not been able to. Ultimately it won't make any difference. I have an extremely rare autoimmune disease eosinophilic cystitis. In the mid 60s I lived on the edge of a cotton field where there was a lot of airel spraying and we would close up the house and try not to breathe. Both my parents died at 52 and I've made it to 60 but I'm far from well. I'd like to know what I was exposed to that killed the cotton plants before harvesting. I live in metro DC and there are no cotton farmers to talk to. To me, it comes down to following the money. Doing so tells us who is making, using and promoting the pesticides and gmo's that are so prevalent in today's food. These are the same corporations that are more interested in the bottom line and therefore willing to take chances with our food supply despite the strong evidence of pesticide pollution in the environment. They are hell bent in opposing the rhythm of nature for their own goals, gambling on our health. Though eating organic may not be perfect, there are many conventional foods, including apples, peaches and strawberries that I would not touch with a ten foot pole. I respect my body too much. A well-written rebuttal. The point about the shortcomings and limitations of EPA's testing standards is especially important - sure, it's maybe one of the best we have right now for suggesting industry-wide regulations, but with sustained consumer advocacy/pressure, it can be a lot better. Rather than add yet another critique to Moyer's article, which I've blogged about elsewhere, I would like to see some at discussion of an issue that Moyer's piece implies: buying organic may just not be possible for most people. So what about some viable alternatives? Rinsing produce with water does very little, in my opinion, to remove pesticide residue: more effective is the use of fruit and vegetable washes, which are available in many grocery stores. These kinds of conversations about the organic vs. non-organic debate seem to ignore reality for most consumers (especially those who fall into the low-income and poor brackets), who are not able to buy a majority of their groceries from the organic section. I have commented on the original Moyer article in an Organic Gardening thread which discussed it. Found this post while researching the most recent story from USA today dated March 20, 2019 "Pesticides in Food, Strawberry, Spinach, Kale have the most residue, a report finds"
One promising solution that helps solve the problem of limiting pesticide usage and also promotes access to fresh produce is local production / urban farming. Many pesticides are used so that produce can make it through the supply chain. Not saying this is a solution on a large scale yet, but increasingly more in the future. Thanks Kristin for writing this article! Still relevant 5 years later.